Being in the mold inspection industry, we get asked all the time: "Is it good mold or bad mold". To be honest, this is a tough question to answer. 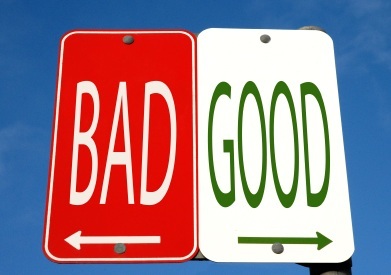 I think instead of looking at it as good vs. bad, it should really be lumped into 3 categories: Good, Normal, and Bad. Let's start with the good, shall we? Molds can be good when they are used for medicines, or in the production of certain cheeses, and let's be honest, mold that is Outside our home is typically considered to be a good thing. So, most people don’t even notice mold when it’s good, unless they are reaching into the fridge for that stinky wine cheese they love so much. Next, we come to normal molds. When talking about normal molds within the home, there are really two types. Airborne mold spores, and mold growth. When it comes to the airborne type, it is simply a fact of life that there is always some degree of airborne mold spores floating around in your home. They come into the home through any gap, penetration, open door, and even on our clothes from the outside, and are considered to be normal, as long as they did not originate within the home. Normal mold growth within the home occurs on a day to day basis. It could be that "mildew" in the corners of your shower, or that weird looking black stuff you see in your window track. What makes it normal, is the fact that it is growing on a non-sustainable food source, the surface is non-porous and can typically be cleaned away with normal housecleaning methods. Now, for the fun part, Bad mold. To put it simply, mold growth within the home is considered to be a bad thing when it is growing on a sustainable food source, and is potentially affecting the air with what would be considered "elevated" mold spores which is quite a bit different than the normal airborne mold spores we talked about earlier. The food sources within a home are pretty numerous, and can include: Drywall, wood framing, wood subflooring, debris, contents, etc... What makes this a bad thing? Well, typically when conditions such as these start to occur, the proper removal of said mold is just a bit much for the average homeowner. Not only must the impacted materials be properly removed and/or cleaned, but the airborne spores in association with the mold must be addressed as well. The proper removal of a mold problem is a very technical process, and requires the right equipment, and is just not something that the average homeowner should take on themselves. The first step a homeowner should take when they believe they may have a mold problem is to have the conditions assessed by a Mold Investigation Specialist. Through a thorough investigation and proper testing, they will be able to tell you if you have a mold problem or not. Or, if you really prefer the terminology, if it's good mold or bad mold.